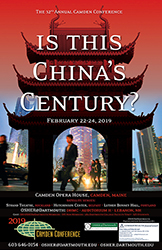 2019 Camden Conference: Is This China's Century? Name: 2019 Camden Conference: Is This China's Century? As China emerges as a major global power, it faces complex challenges in its domestic economic, social, environmental and political affairs and its relations with Asian neighbors, the United States and the broader international community. Expert presenters from China, East Asia, Europe, and the U.S. will describe and analyze these challenges. Drawing on their extensive professional and personal experiences, the speakers will explore a wide range of topics: issues and expectations within Chinese society today; the dramatic reduction in overall poverty and the rise of a middle class; the roles of the Chinese Communist Party and its leadership; the outlook for China's economy, long fueled by exports and substantial foreign investment; China's aspirations in technology and innovation; the environmental impact of China's industrial expansion and its role in addressing climate change worldwide; relations with neighboring countries in Northeast and Southeast Asia; and current and future U.S.-China relations, including controversies over trade, human rights, and the U.S. role in the stability and security of the Asia-Pacific region. OSHER@Dartmouth will live-stream the 2019 Camden Conference from DHMC's Auditorium H. The registration fee includes admission to all three days of the conference. For more information, click here to view a PDF of the event brochure, or visit www.camdenconference.org. Please Note: OSHER@Dartmouth participants must register through osher.dartmouth.edu, not the Camden Conference website. For those attending the conference from a distance, we have secured special hotel rates at the Hilton Garden Inn, Lebanon, NH Rte 120, for Friday, February 22 and Saturday, February 23. Rates are as follows: Queen room rate per night is $139 plus taxes and King room rate is $129 per night plus taxes. Less than 2 miles from Dartmouth Hitchcock where the Camden Conference will take place.